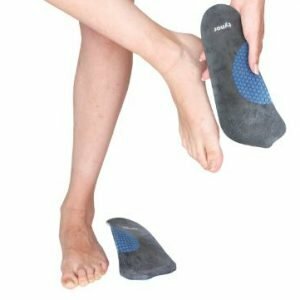 Insole full Silicone is designed for superior comfort, with soft relief zones. It reduces the painful shock waves and load to feet, knees and the spine. Anatomically designed for better comfort and fitting. It provides even pressure distribution throughout the foot. Made from high quality, liquid, transparent, aesthetically pleasing, medical grade Silicone, with high shear strength and with high cushioning coefficient, having excellent shock absorption & energy return. It is hypoallergenic, odorless and has a long functional life. Being nonporous and non-absorbent, it is easy to clean and maintain. Anatomical design ensures better weight distribution, helps correct body alignment, reduce strain on ligaments, muscles, and tendons and reduce peak loading. Matte surface ensures good grip to the foot. Super soft zones provide focused pain relief, relieves pressure at the base of the calcaneus and enhance comfort at the metatarsal area. Ergonomic designing improves compliance. Mesh design further enhances cushioning. Optimal thickness allows effective cushioning on one hand but can be easily be put into shoes on the other.